Made shortly after Illusion Travels by Streetcar, the complicit The River and Death may be the closest thing to a contract job in Luis Buñuel’s entire canon. Miguel Álvarez Acosta, the author of the novel from which it was adapted, insisted that Buñuel respect the film’s condescending thesis conflating education and crime. 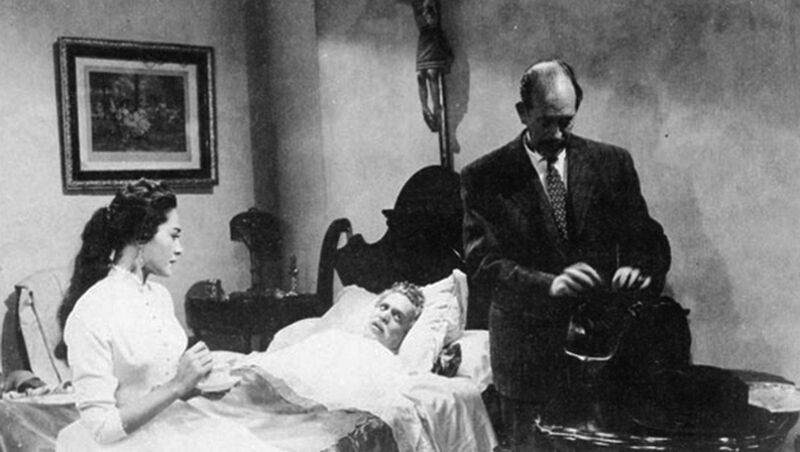 As one man puts it to another man late in the film: “If all men went to university we would have less crime.” Buñuel, who would later call Acosta’s argument absurd in his autobiography (certainly the director was never one to wear his themes on his sleeve), allowed himself to be strong-armed by his producer, and it shows. The River and Death is about the sensation of Latin American violence, pieced together from a number of vendettas that plague a coastal town. Buñuel’s best films often implicate nature and social institutions in the degradation of human life, but River and Death is scattershot—the director’s pot-shots at religion and government are both scarce and toothless, and there’s little complicity evoked between the town’s river and the local bureaucracy. Over and over again, men are killed for the smallest mistakes and infractions. It’s an absurdity that certainly intrigues Buñuel, but it’s not one that the film intelligently plumbs. Every vengeful scenario is only vaguely different from the next, and as such the film wears on the nerves. Book-ending the endless string of murders and dramatic funerals is a confrontation between a low-life and an educated man, linked to each other by their fathers’ deaths. The cultivated man condescends to the uneducated man’s barbarian thirst for blood, mocking his honor and machismo before daring him to shoot him in the back. For a director who made a career of putting bourgeois ghouls in their place, it’s a pity the lower-classman doesn’t pull the trigger.